The two rock types most commonly found in this district are sandstones and shales. These rock types weather down quite differently, both by chemical and physical processes, during exposure to water and extremes of temperature. Quartz grains, found in sandstones, are made of silica which does not break down chemically. Sandstones are resistant to chemical weathering when held together with a quartz cement, but wherever the cement is either clay or iron rich or missing, the sand grains become loose and will be washed out. Variable types of cement result in differential weathering, producing deep, yellow cavities or a honeycomb pattern on some rock faces. This is also apparent where poor quality stone has been used for building and the rock is exposed to rain and frost. Other materials such as feldspars and muscovite found in the Millstone Grit will eventually break down into clay particles. 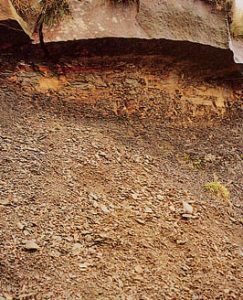 Flaggy sandstones with numerous bedding planes will decompose much more readily than a massive quartz sandstone which is resistant enough to produce exposed cliffs and benches. Shales contain clay particles in finely laminated beds and break down easily when exposed. Organic acids produced from plants and rain water react chemically with shale to speed up the weathering process. Most shale outcrops are hidden by layers of debris and vegetation. Freeze-Butterley Cutting, Marsdenthaw weathering occurs when temperatures fluctuate around 0°C. Water present within pore spaces, along with bedding planes and in joints, expands on freezing, causing blocks to fall from cliff faces. Angular blocks form scree slopes which are found below many gritstone edges. 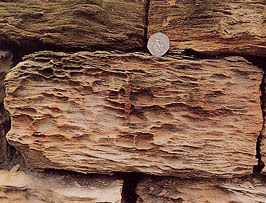 Freeze-thaw conditions continue to break down sandstone blocks into quartz grains or fragments. This is why some moorland footpaths appear to be covered with a white sharp sand bleached by acids from the moorland peat. Sandstones can have a variety or colours. The brown colouration of weathered rock is caused by the oxidation or rusting of iron minerals cementing the particles together. Black surface colouration on the rock results from soot being deposited – a legacy of the burning of coal in domestic hearths, mills and factories before the Clean Air Acts of the 1950s. Because the atmosphere now has less soot and dust the buildings are slowly cleaned by acid rain-water, although the rain-wash is more effective on smooth ashlar sandstone than it is on rougher wall stone. Fine ashlar buildings in Huddersfield, such as the Town Hall and the Railway Station have responded well to being commercially cleaned, with the sharpness of carving and the pale colour of Crosland Moor sandstone (Rough Rock), well displayed enhancing the townscape. 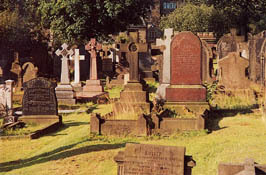 Graveyards are fascinating places for geologists to study. Many headstones are made of the best local sandstones. These are easily worked, with inscriptions often legible after 150 years of weathering. During the19th century the use of limestone or marble headstones was unfortunate because acid rainwater reacted unfavourably with calcite, etching the polished surface of the stone. The use of lead letters inset into marble headstones is an improvement but as the stone weathers, the letters are loosened and may fall out. There is a long history of the use of exotic stones from other parts of Britain and overseas. Most of these are igneous rocks, such as granites and gabbros, which take a high polish. They are hard and therefore more difficult to engrave and are less prone to most forms of weathering as their crystalline texture has few weaknesses. Their highly polished surfaces do not allow the accumulation of soot or lichens as readily as other rock types. Holmbridge churchyardNowadays many churches place restrictions on the use of these highly polished headstones, preferring local materials. For more information about the Rocks and Landscapes of Huddersfield see our other pages on Local Geology and our guide to the Geology of Huddersfield.